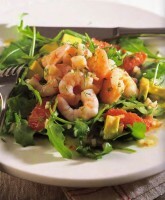 This is another summer recipe that is quick to make, easy to prepare ahead, and stunning on the plate. What makes this recipe stands out is the mix of Asian spice and western technique. 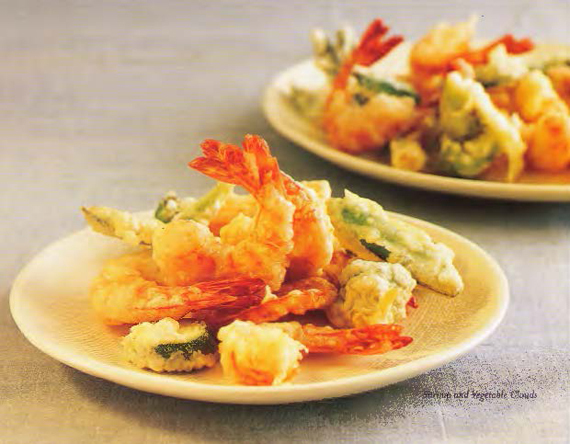 All too often fushion means confusion–a muddle of ingredients thrown onto a plate with no reason or structure. But just occasionally, the East and West combination makes brilliant flavor. Fruit with fish was never my favorite partnership until I came across this recipe. It seems that the acid in wine and orange juice, backed by the zip of Dijon mustard, provides just the balance needed for the sweetness in fruit. Encouraged, I tried an alternative mix of cucumber with strawberries seasoned with balsamic vinegar, with equal success. Neither takes more than 10 minutes to make, so I invite you to take a gamble and see if our tastes agree. You’ll find any firm fish is good cooked this way, including salmon and monkfish. We once had a summer house near Dieppe, on the Normandy coast, and ever since I have loved mussels. 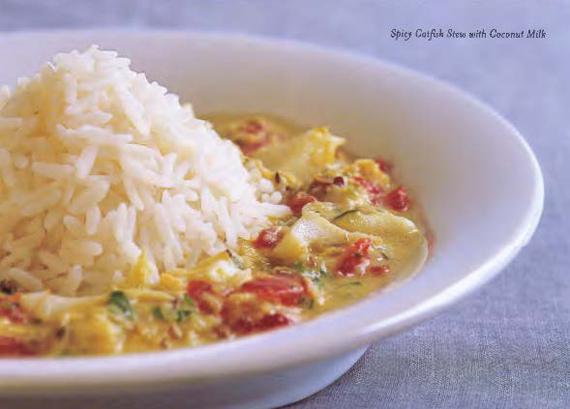 Saffron is a natural partner for fish, and colors this fragrant stew a glowing orange-gold. 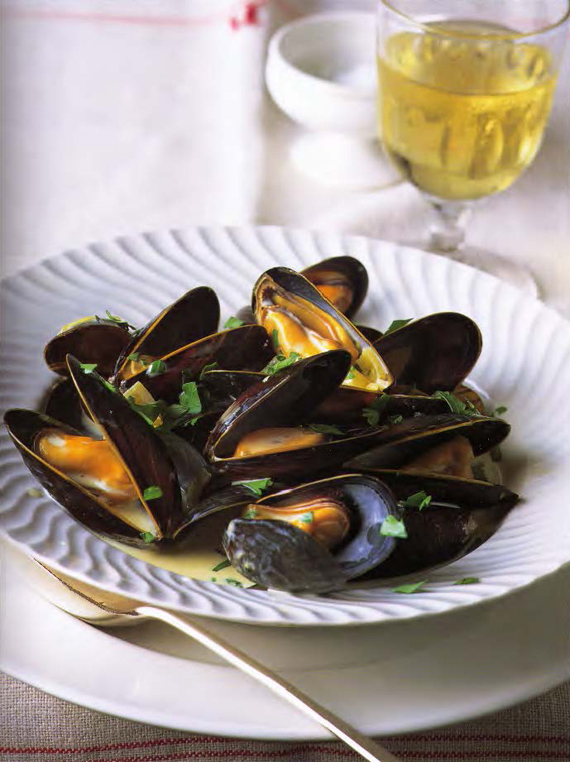 Clams can be substituted for mussels, but allow more time for them to open over the heat as their shells are thicker. This looks like a long list of ingredients, but many of them will be in your cupboard and all chopping is done in the food processor. Any white fish fillets such as perch or tilapia can replace catfish. Serve the stew with boiled rice. A rice pilaf is all that’s needed to accompany these cheerful kebabs. By all means try other vegetables not listed here, or for a shortcut, choose just two or three from the list. 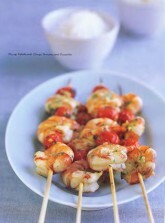 A mild vinegar, such as cider or rice wine, makes a good dipping sauce. At sea in the old days, fishermen cooked their meals in a chaudière, hence the word chaudrée for fish stew. The term migrated with cod fishermen to the Grand Banks off Nova Scotia, and thence to the New World as chowder. Chaudrée was once as important on the Atlantic coast of France as Bouillabaisse along the Mediterranean. Like Bouillabaisse, Chaudrée is a whole meal and there are many versions. This simple recipe from the port of Fouras, near La Rochelle, contains plenty of onions, butter (a regional specialty) and a variety of fish, always including cod. Today I would expect to find hake, whiting, pollock, and possibly conger eel as well. This recipe suits many sizes of shrimp, from giant gambas and prawns on down, including langoustines (scampi or Dublin Bay prawns). The shrimps must be raw, and in their shells, with or without heads, but don’t use baby shrimps as they will absorb too much salt. Here’s the place to use your special artisan fleur de sel. You’ll find guests jump right in, peeling the shellfish at table as a first course or luxurious main course. Red mullet is prized in France, as much for its brisk, almost gamey, taste as for its brilliant skin. It’s a small fish, sometimes tiny, so more than one may be needed per person. Any small whole fish, particularly bream, can be used instead. The regional twist comes with local oils: olive oil in the south, or walnut or hazelnut oil further north. Vinegars range from artisan brews using red or white wine, or perhaps Champagne, to the cider vinegar that has long been a part of fish dishes in Normandy and Brittany. For frying, olive or vegetable oil is best as most nut oils scorch easily. 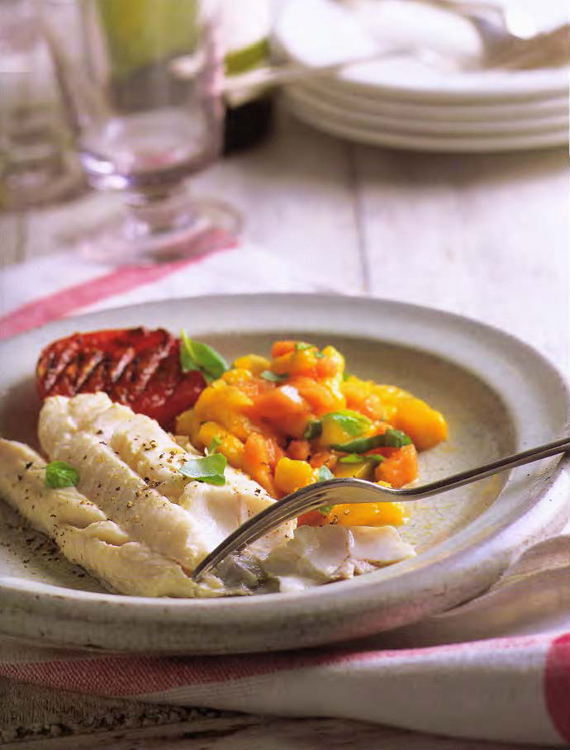 With its pink skin and bright tomato garnish, this is one of the prettiest fish dishes I know! 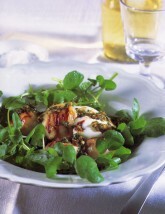 As an accompaniment you cannot do better than a salad of fresh greens or a lightly cooked vegetable such as green beans.